Class Rosters - available in MyView; class rosters may be viewed, printed, or downloaded to Excel. Who Has Access To Electronic Class Rosters? If you are the official instructor of record for a course or section (the Registrar's Office has identified you by your "emplid" as the instructor for that course or section) then you will automatically have access to the Class Rosters through the MyView Faculty Center. 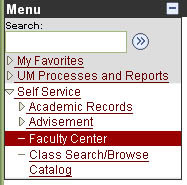 Sign on to MyView, Go to menu (left hand side) and click on Self Service, then click on Faculty Center. The "Faculty Tab" will then display. Click on the "Class Roster" symbol next to your class to retrieve the roster. For additional, download the MyView Faculty Center Help Guide as a PDF or visit the MyView Staff Help page. NOTE: To ensure security, all UM System web applications prompt for your UMSL SSO (which is the same as your e-mail user ID, before the '@' sign) and password.